Fry the meat cut in small piece, in a small amount of oil. 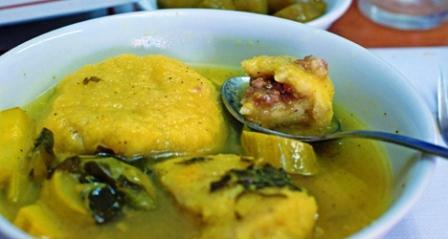 Prepare the dough for the Kubbeh, by mixing all ingredients. Fill with 1 tsp of meat and shape back into balls. Heat the oil, sweat the garlic but do not over cook, add the scallions, continue to sauce with a pinch of turmeric, salt and pepper. Add the Swiss chard mix well. Cook about 5 minutes until the chard is just wilted. Cover with chicken stock and continue to cook. When almost done add lemon juice and lemon salt to taste. Add the Kubbeh to the boiling soup, and continue cooking about 15 minutes.